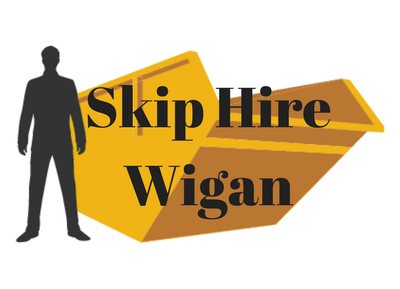 Looking for skip hire in Wigan? You’ve come to the right place. Our skips provide you with a space to keep your waste products and excess materials that you no longer need, keeping your home or business premises clean, tidy and organised. Unlike some other companies in Wigan, we excel when it comes to customer service. We give you more choice and flexibility and can answer any questions that you have about our services. You can select the size of your skip on our website. This way, you know exactly what to expect. Then, we’ll arrange a time and a date to deliver your item based on your schedule. We’re pretty flexible with our times, so if you want your skip delivered in the evening or at the weekend, that’s fine. With Wigan skip hire, you can count on us for providing you with exactly what you need in order to dispose of your waste safely and efficiently. Our team of experts have a wealth of experience, so if you’re unsure about which skip you require, discuss the nature of your project with us – we can identify whether a domestic or a commercial skip would best suite your needs. Regardless of whether you’re looking for domestic or commercial skip hire Wigan, you can expect to receive a convenient service from our team of experts, here at Adlington Skips. We make sure that your requirements are met appropriately and that your waste is disposed of efficiently, preventing any dangerous consequences. Our Wigan skip hire services are guaranteed to suit your budget requirements, we make sure that our skips are priced competitively, offering the best value for money. In one sense, Wigan skip hire can keep your costs to a minimum by providing a suitable way and means for disposing of the waste your project generates. The skips for skip hire Wigan are ideal for keeping any sharp objects off the ground, eliminating the risk of injury, but most importantly, helping you to avoid expensive fines. Rather than fly tipping your waste or throwing hazardous materials away with general waste, we provide skip hire Wigan to allow you to dispose of your waste responsibly, ensuring that at least 90% of the contents within your skip is recycled. We supply skips in a variety of sizes, so you needn’t worry about finding something suitable from our extensive collection of skips! The team here at Adlington Skips can offer their expertise when it comes to finding reliable skip hire Wigan. Arrange Wigan skip hire today!